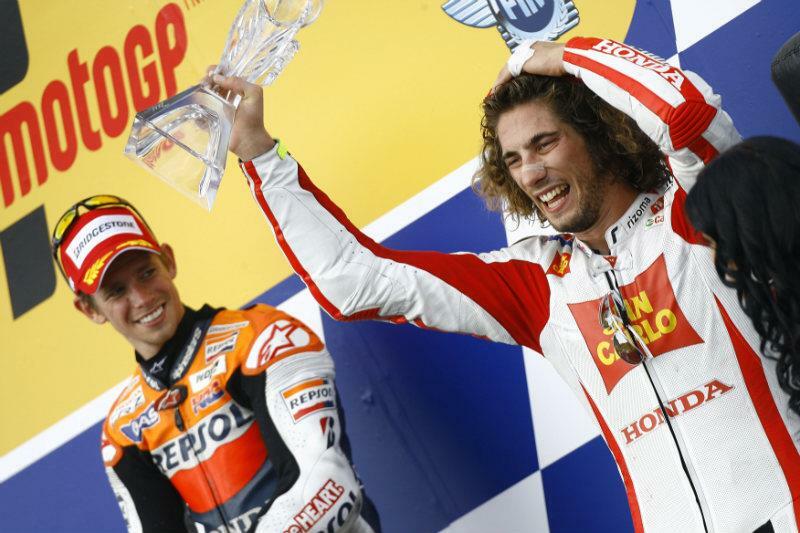 Marco Simoncelli scored his first MotoGP podium at the 29th attempt in Brno yesterday. After several near misses in 2011, the San Carlo Gresini Honda rider finished third in the Czech Republic race after passing reigning world champion Jorge Lorenzo on the 12th of 22-laps. He was unable to hunt down and pass Italian rival Andrea Dovizioso to take second but the former 250GP world champion was still elated to end his premier class podium drought. And it was particularly gratifying given the scathing criticism aimed at Simoncelli for his aggressive riding tactics this season. He was involved in a controversial collision in Le Mans with Dani Pedrosa that ended the Spaniard’s world title hopes. But in Brno he was making headlines for the right reasons and he said: "I am very happy with this result and I needed it because many times this year I was really fast but for some different reasons I never get the result I should. I am so happy and I need to say thanks to everybody who believed in me in the difficult moments, especially my team and Honda. "It was a difficult race because I didn’t start very well. But I enjoyed it because I passed Valentino (Rossi) and (Ben) Spies and then I caught Lorenzo and Andrea. Around the half race I pushed to pass Jorge and I tried to catch Andrea but until the last five laps I believed I could beat him. But he started to push more and I prefer not to take big risks and save the podium." For more from Simoncelli on his first podium, check out this week’s copy of Motor Cycle News.